Temperatures are dropping, and it’s time to turn our attention to pumpkins. These pumpkin activities for preschoolers will keep kids occupied all season long. 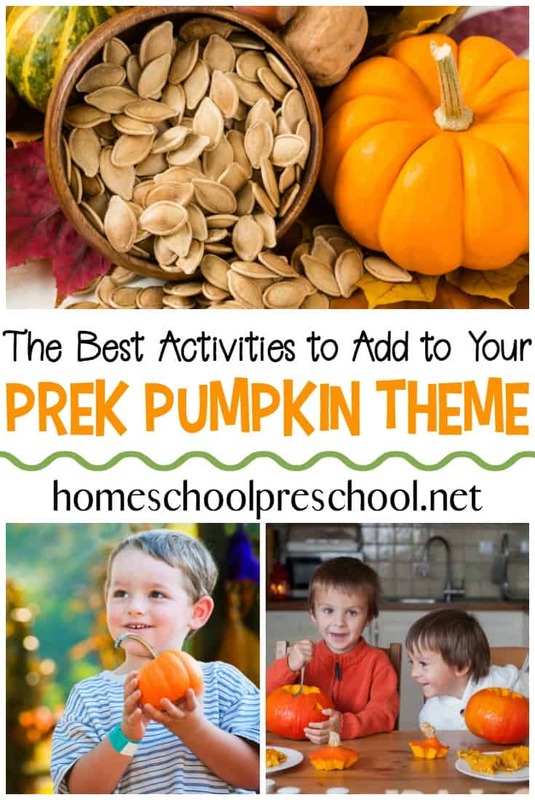 What an amazing collection of activities to add to your preschool pumpkin theme! Below, you’ll find crafts, printables, books, and more! You’ll find everything you need to keep your kids busy and entertained all month long! I love teaching preschoolers with fun seasonal themes. Pumpkins are a favorite for us! There’s such an abundance of topics to be covered, and no shortage of books, printables, and themed resources to incorporate into the activities. Below, you’ll find all of the posts I’ve written to date that you can use with your preschoolers. Be sure to check back frequently, though, because I’m always adding new posts to this list. • 12 Board Books About Pumpkins – Enjoy the fun of autumn with these board books about pumpkins. Fill your book basket with these books that are perfect for little hands! • 21 Perfect Pumpkin Books for Preschoolers -Here is a fun list of pumpkin books that are not Halloween related. They are perfect for preschoolers, and they’ll lead to great autumn conversations. • Candy Stuffed Pumpkins: A Simple Pumpkin Craft for Kids – Candy stuffed pumpkins will make cute centerpieces at your autumn celebrations. The best part is that they’re simple enough for kids to do! • Pumpkin Apple Stamps: A Fun Fall Craft for Kids – How can your children turn an apple into a pumpkin? They can with this fun autumn craft! These pumpkin apple stamps are fun for kids of all ages. • Pumpkin Spice Playdough – This easy homemade playdough takes less than 10 minutes to make. It’s non-toxic, and it smells heavenly. This pumpkin spice playdough is the perfect thing for autumn-themed sensory play! 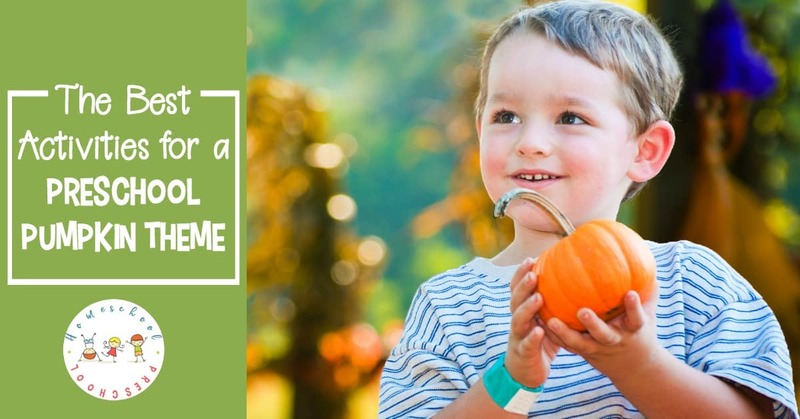 • 30 Activities to Add to Your Preschool Pumpkin Theme – If you’ve got pumpkin on the brain this fall, you don’t want to miss any of these activities that will make a great addition to your preschool pumpkin theme! • Pumpkin Themed Fall Corn Mosaic Art – I love trying unique art projects with my little ones. This pumpkin-themed corn mosaic art project is so much fun! It’s perfect for your fall crafting sessions. • Pumpkin Life Cycle Preschool Activities – It’s always more fun to learn with hands-on activities. These pumpkin life cycle preschool crafts and activities will engage your young learners with more than just another worksheet! • Pumpkin STEM Activities for Kids – Bring pumpkins into your homeschool preschool lessons with these pumpkin theme activities! Kids will love these hands-on pumpkin STEM activities for kids. • Preschool Life Cycle of a Pumpkin Printables – This is a great time of year to incorporate pumpkins into your preschool lessons. It’s the perfect time of year to learn about the life cycle of a pumpkin. • The Perfect Pumpkin Printable for Preschoolers – Fall is just around the corner. With it comes all things pumpkin! Don’t leave your preschoolers out of the pumpkin fun. Share this pumpkin printable with them! • Star Wars R2D2 Pumpkin Art at Crystal and Co.
What is your favorite activity for a preschool pumpkin theme? Be sure to leave a comment below, and let me know!